Non-motor symptoms are gaining relevance in Parkinson’s disease (PD) management but little is known about their progression and contribution to deterioration of quality of life. We followed prospectively 707 PD patients (62 % males) for 2 years. We assessed non-motor symptoms referred to 12 different domains, each including 1–10 specific symptoms, as well as motor state (UPDRS), general cognition, and life quality. Hoehn & Yahr (H&Y) stage was used to categorize patient status (I–II mild; III moderate; IV–V severe). 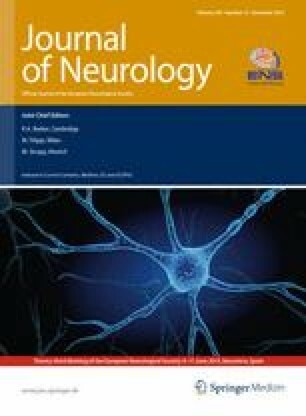 We found that individual non-motor symptoms had variable evolution over the 2-year follow-up with sleep, gastrointestinal, attention/memory and skin disturbances (hyperhidrosis and seborrhea) becoming more prevalent and psychiatric, cardiovascular, and respiratory disorders becoming less prevalent. Development of symptoms in the cardiovascular, apathy, urinary, psychiatric, and fatigue domains was associated with significant life-quality worsening (p < 0.0045, alpha with Bonferroni correction). During the observation period, 123 patients (17 %) worsened clinically while 584 were rated as stable. There was a fivefold greater increase in UPDRS motor score in worse compared with stable patients over 24 months (p < 0.0001 vs. baseline both in stable and worse group). The total number of reported non-motor symptoms increased over 24 months in patients with motor worsening compared to stable ones (p < 0.001). Thirty-nine patients died (3.4 % of patients evaluable at baseline) with mean age at death of 74 years. Deceased patients were older, had significantly higher H&Y stage and motor score, and reported a greater number of non-motor symptoms at baseline. In conclusion, overall non-motor symptom progression does not follow motor deterioration, is symptom-specific, and only development of specific domains negatively impacts quality of life. These results have consequences for drug studies targeting non-motor features. On behalf of the PRIAMO study group. The members of the PRIAMO study group are given in Appendix 1. A. Antonini has received honoraria for consulting services and symposia from Abbott, Boehringer Ingelheim, GSK, Lundbeck, UCB, Novartis and Merck Serono; P. Barone has received honoraria for consulting services and symposia from Boehringer Ingelheim; R. Marconi has received honoraria for consulting services and symposia from Boehringer Ingelheim; L. Morgante has received honoraria for consulting services and symposia from Boehringer Ingelheim; C. Colosimo has received honoraria for consulting services and symposia from Boehringer Ingelheim; and all other authors have nothing to disclose. The study was approved by the Ethic Committee of each individual institution. Dipartimento di Neuroscienze, Scienze Psichiatriche ed Anestesiologiche, Università di Messina, Italy. Tania Corbetta, Arina Dumitriu, Boehringer Ingelheim, Milan, Italy. Alessandra Manfredi, clinical operation specialist MediData Studi e Ricerche, Modena, Italy.